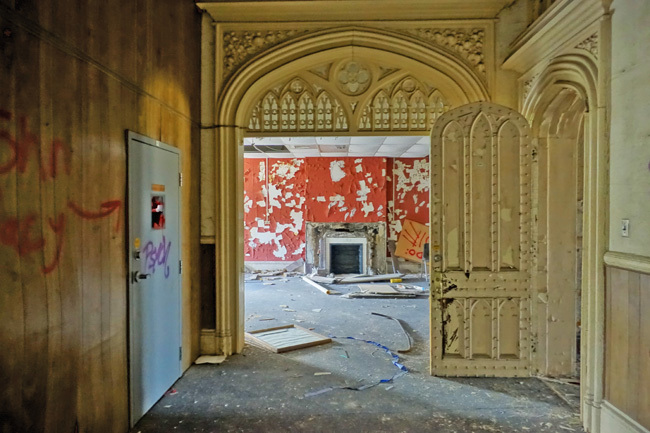 The beautiful neo-Gothic prison compound of Joliet Correctional Center stands abandoned and decaying after operating for nearly a century and a half. 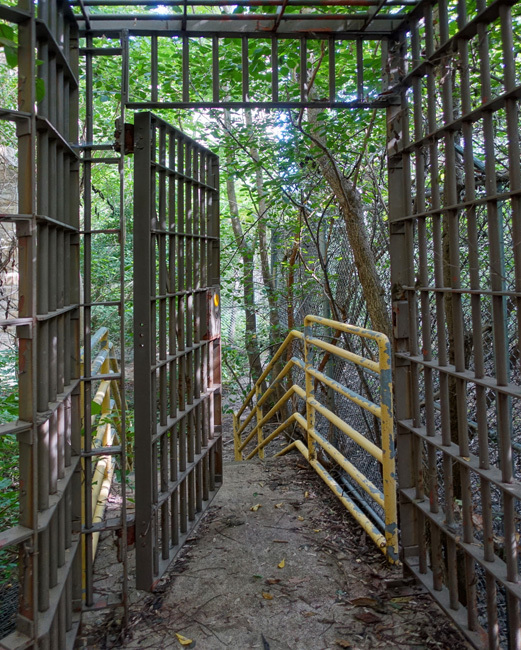 After a stroll through the legendary ruins of Joliet Iron Works, I headed to the massive walled-off prison compound that lies just north of the abandoned steel mill. 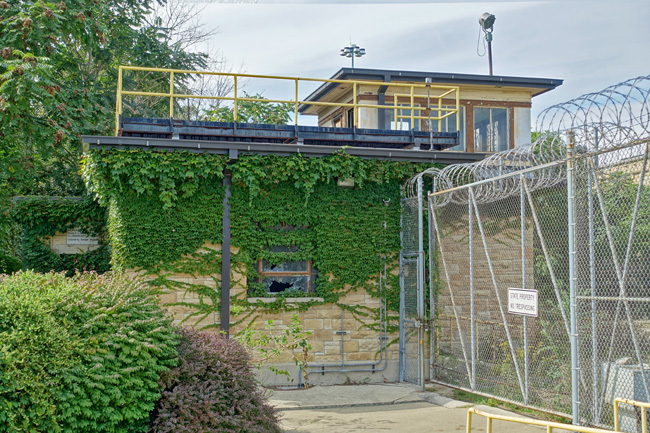 Surrounded by 25-foot-high limestone walls topped with razor wire, Joliet Correctional Center covers 20 acres of land. 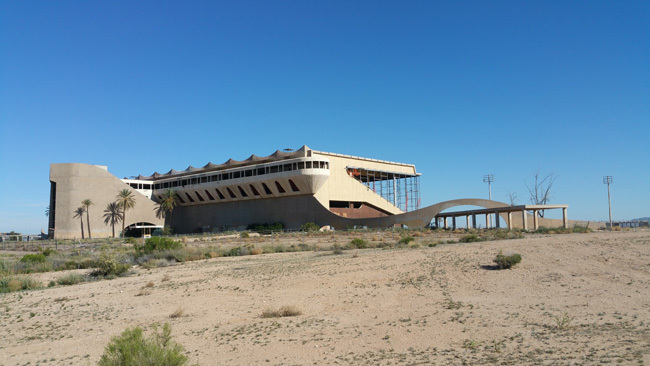 The once self-sustaining compound consists of 24 buildings, including guard towers, cell blocks, administration buildings, light industrial facilities, a hospital, laundry, cafeteria, chapel and gymnasium. 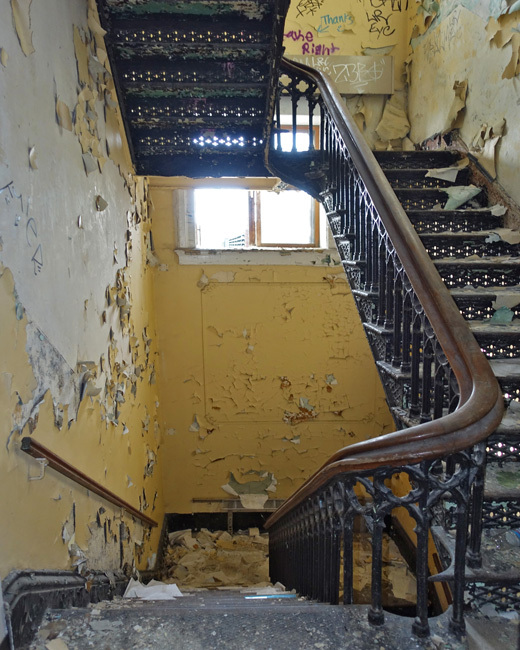 After years of neglect and vandalism, many of the structures are severly deteriorated. Thick blankets of ivy cover the walls and fences. The grounds are overgrown with weeds that have pushed up through the cracked pavement. 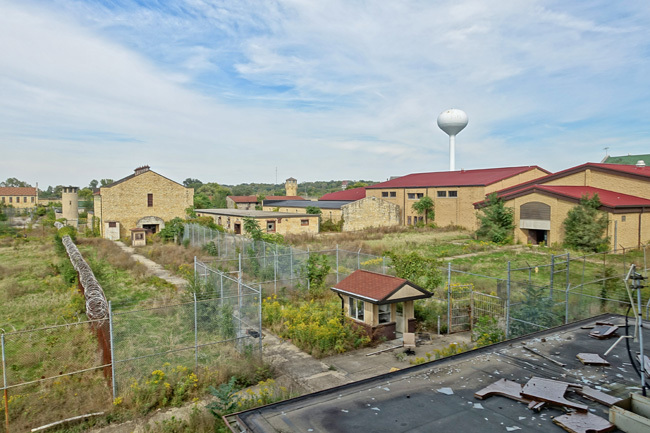 The prison compound itself is not open to the public, but the parking lot has been transformed into the Old Joliet Prison Park. Visitors can enjoy a view of the castle-like main structure and read about the prison's history on a handful of informational signs. Fortunately I was able to convince a friend of a friend who worked for the City of Joliet to grant me limited access to the administration building. I was in awe from the moment I stepped inside. 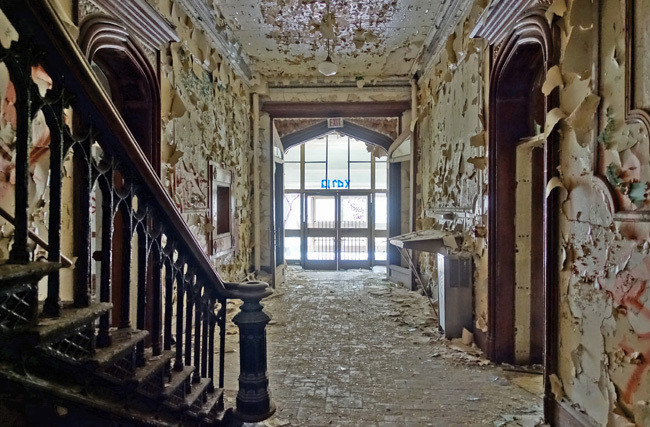 With elegant arched doorways and ornate wrought iron staircases, it looked nothing like how I imagined the interior of an old prison. 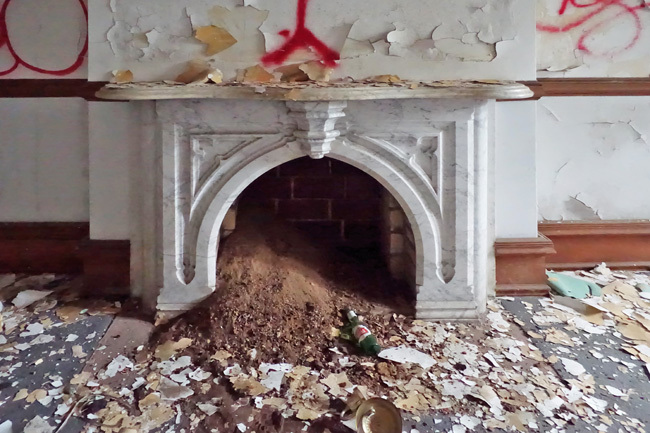 Some of the rooms even had marble fireplaces. 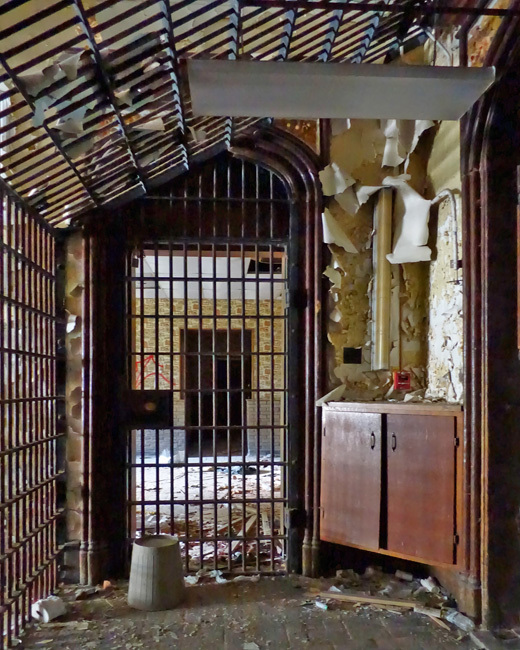 It was strange to see such beauty juxtaposed with the stark iron bars that separated it from the inmate areas. Joliet Correctional Center opened in 1858, originally built to replace Illinois State Prison in Alton. Inmates were brought in from Alton to build the new prison, using limestone that was quarried on site. By the late 1800s, the prison population had grown to a record-breaking high of 1239. 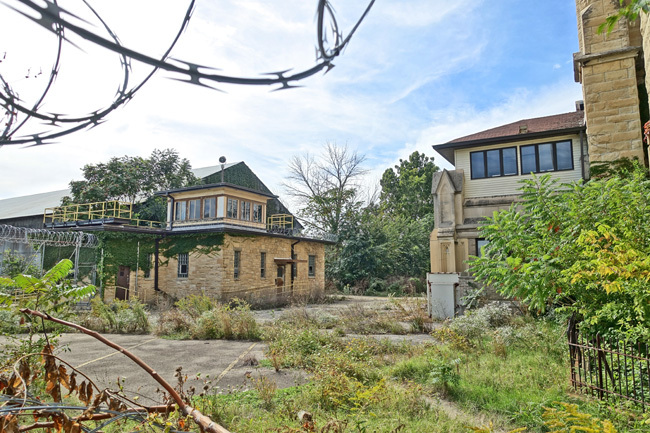 In addition to overcrowding and concerns over the compound's aging infrastructure, exhaust from the nearby Joliet Steel mill was becoming a problem. Smoke often rolled in and covered the prison grounds in a thick haze, causing health problems for inmates and prison staff. One warden even resigned and moved away due to health concerns. In 1910, the prison commissioners decided the facility needed to be replaced. Stateville Penitentiary opened in 1925, intended to replace it, but Joliet Prison remained open. The facility has held quite a few notable inmates, including prisoners of war during the Civil War. 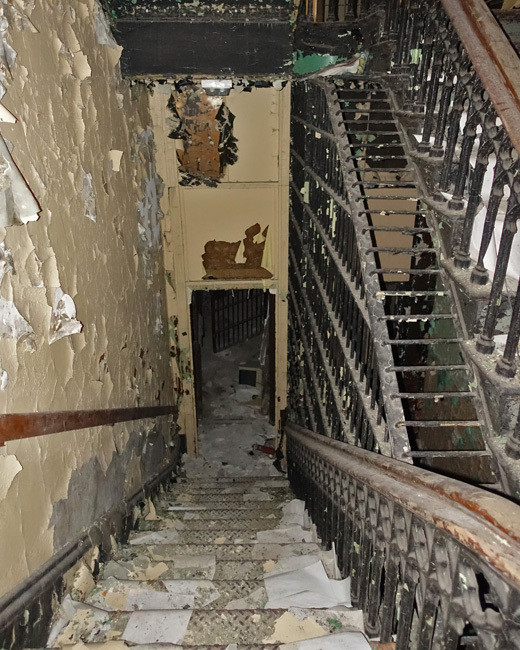 The infamous murderers Nathan Leopold and Richard Loeb were incarcerated there. Serial killer John Wayne Gacy also spent time in Joliet Prison before being sent to Stateville Correctional Center. 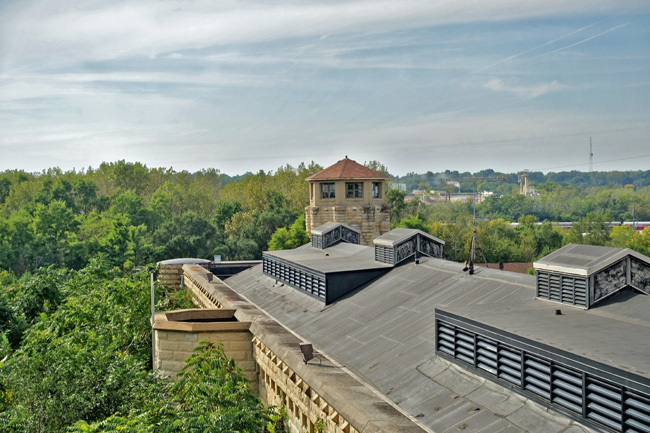 Joliet Correctional Center has been featured in several movies, including The Blues Brothers and Let's Go to Prison. 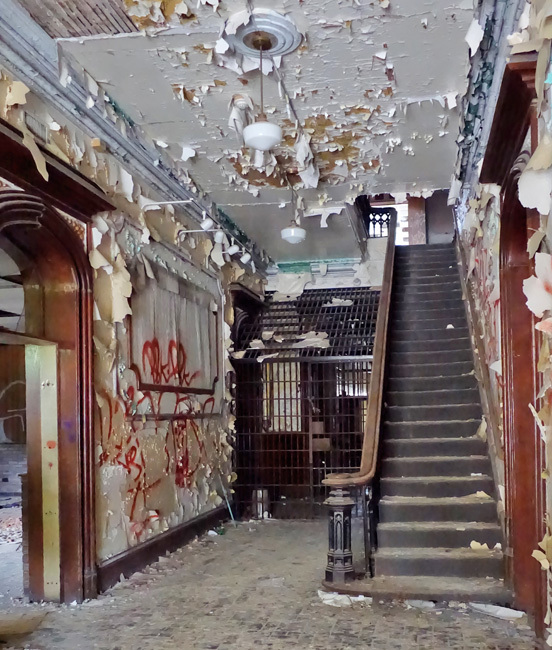 Since its abandonment, it served as the setting for Season One of the T.V. show Prison Break and an episode of Bones. The prison was also mentioned in songs, including "Percy's Song" by Bob Dylan, "Joliet Bound" by Memphis Minnie, and "Lincoln Park Pirates" by Steve Goodman. Joliet Correctional Center closed in 2002 due to budget cuts and the aging of its buildings. Most of the inmates and employees were transferred to Stateville Correctional Center. Redevelopment plans for the site are still in the works. 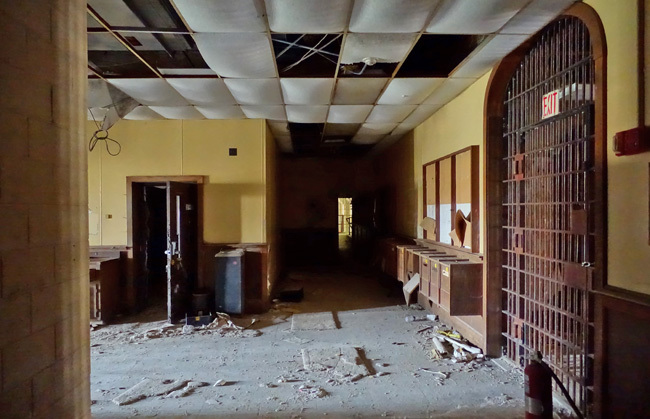 The Joliet Area Historical Museum wishes to preserve the prison and open it for tours, though developers have submitted other plans that would require demolition of many of the historic structures. I only got to see a small portion of the massive facility during my visit, but I hope to return one day if/when the grounds have been opened to the public. Grateful for the opportunity to explore such a unique site, I said goodbye to Joliet and continued eastward on my Epic Rust Belt Road Trip. Next stop: an abandoned power plant. If you enjoyed this article, please share it on Facebook. I would be forever grateful! To receive an email announcement when I post my next article, please subscribe to Places That Were. By the way, I have way more photos of Joliet Correctional Center than I was able to include here. I'll be sharing them on social media, so please follow the links below if you'd like to see more of this incredible abandoned prison. Another awesome job! Prisons and Hospitals give me the most hee-bee-jee-bees! What a fantastic place. I imagine it was wonderful to see. Lucky you! I really enjoyed this. Did not know that about the Blues Bros. movie......neat! Thanks, Sue! I felt very fortunate to get to see the inside of the main building. I hope I get to explore the rest of it some day. Pity it’s left to die due to neglect and vandalism. For what it’s worth, it is a landmark and historical site, and a monument to those who built it. It really is a shame. I was shocked to see that several floors had collapsed already. I hope they hurry up and get to work preserving the structures it before it's too late. As you mentioned, home to "Joliet Jake" and "Elwood Blues". At least for one movie. Are prisons the creepiest things to visit? I'd probably freak out. 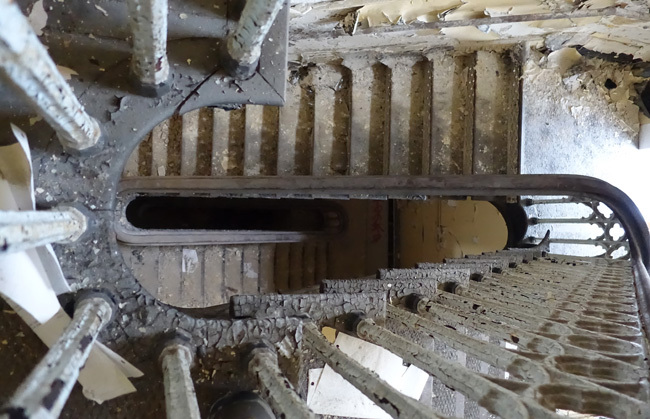 Prisons are pretty creepy, but hospitals are definitely creepier. I've seen some really spooky ones. Psychiatric institutions too. Thank goodness the air is cleaner nowadays. It must have been awful to breathe in all that exhaust. Still it would be amazing to go back in time for a day and see what the town was like during your great grandfather's era. Another great explore and write-up. Thanks for giving us this look inside the admin building! Thank you, Greg! I'm glad you enjoyed it. I hope they open it to the public too. It would be such an amazing museum and could probably bring in a lot of tourism. I just came here because of a story that two teenage girls were fined for trespassing when one became trapped there somehow. I commented to someone that the prison should be demolished then later commented it should become a museum as was an old prison in Jefferson City, MO. 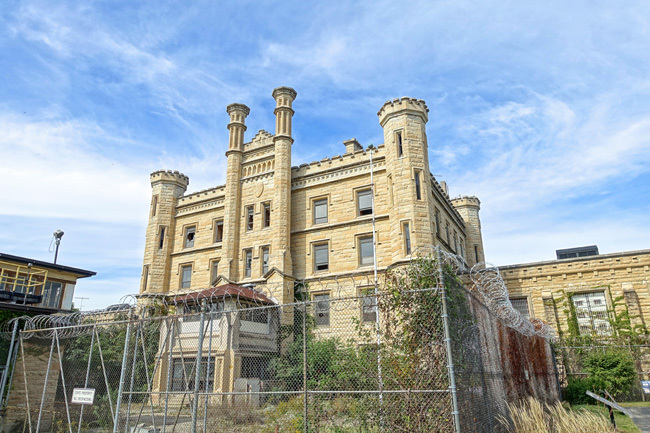 Now see that the Joliet prison should be made into a museum, maybe also a haunted house as I assume some spooky things have occurred there as in the old Jeff City prison. I just found the article. It's a shame they had to break through the wall with a sledgehammer. 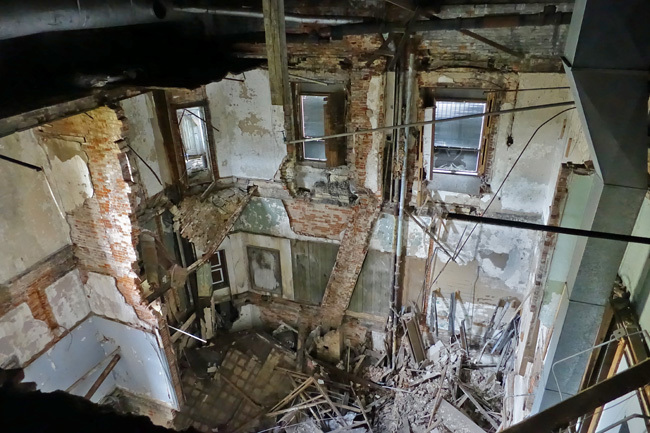 I hate it when carelessness results in damage to beautiful old buildings. Must have been a terrifying experience for her. Ugh, I hate people who do vandalism to buildings like this! 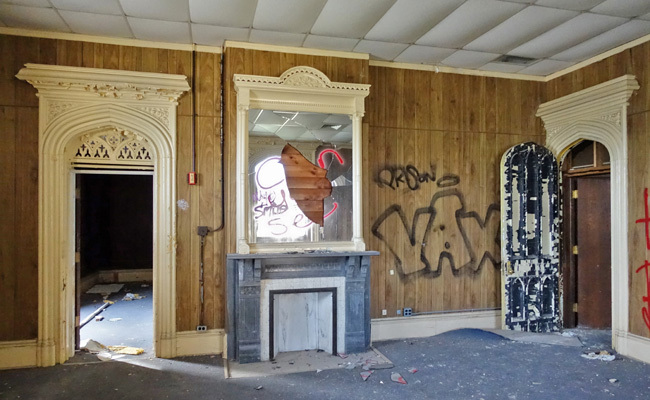 I always believe in not vandalizing things, and if I can't find an opening inside a building via an open window or door or other hidden entry point, I don't enter. Simple as that. The city of Joliet(if that's who owns this building today, it seems), would make so much money doing occasional tours of this building. I wish they'd copy off the organization in Buffalo, NY that occasionally opens their former train station to the public, for tours and other event. That btw served briefly as a train station into the Amtrak years, before it was relocated to nearby Depew, NY. Anyway back to this building, loved your entry on this place. I'm super jealous your friend knew someone who worked for the city of Joliet, and allowed you access into the administration building. 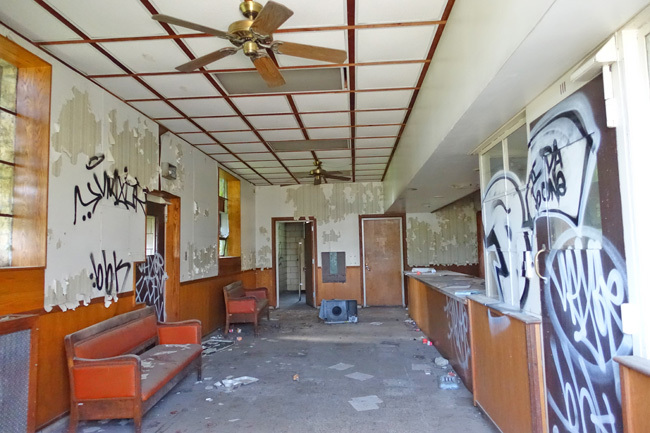 By any chance, did you visit the former drive-in theater while you were in Joliet? I think it was called the Hilltop. I agree; the city definitely should allow occasional tours of this place. There is probably a lot of red tape and liability concerns preventing that from happening, but if it ever becomes a reality I'll sign up for sure. The part I saw was amazing, but it was only a small portion of the entire facility. Now I want to check out the Buffalo train station. I'm going to look into it and see if I can get notified the next time they offer a tour. I had no idea about the old drive-in. Wish I'd known about it when I was in town. I'm going to research it so I can check it out next time I'm in the area. Thank you for the suggestion! Went there yesterday and there are police on patrol ever since those kids set the place on fire a month ago. Wouldn't think on a Monday afternoon cops would be there but they were. Such a shame that the place was set on fire. I wish people had more respect for neat old historic buildings. I would really like to do a photo shoot there, How hard is it to be able to get a pass to spend a few hours in there? Not sure if it's true but apparently they are using it as a haunted house this year. Already creepy enough. I've heard that too. That should be really interesting. The haunted house is the old women's prison across the street. as a resident there from 1994-2000, (15 total years inside idoc) i can tell you "somehow" i have fond memories there.....just a different way to line actually. MBA here prior to going in - and i have managed to rebuild a decent, quiet life since getting out on 2009. Found memories? yes, there were some. Don't knock it till you try it. I grew up about about six blocks from there in the 60's-70's. My brothers used to go to the cemetery. Did you happen to have stubbled onto it? 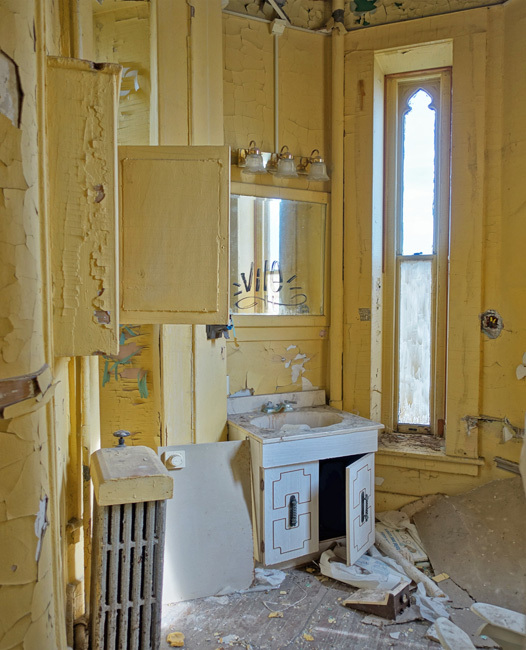 Also, Al Capone and Richard Speck, the mass murderer who killed 8 nurses in South Chicago in '66, were housed there. My best friend lived across the street from the prison and my husband's aunt's house is also near the prison and was used in the movie set "Blues Brothers." I hope they turn into a museum soon before it's totally destroyed. I have fond memories of that town and the near East side. I didn't know the Hilltop drive-in was still there. I spent a lot of time at that drive-in growing up. Tours are now offered of the jail. Check facebook. 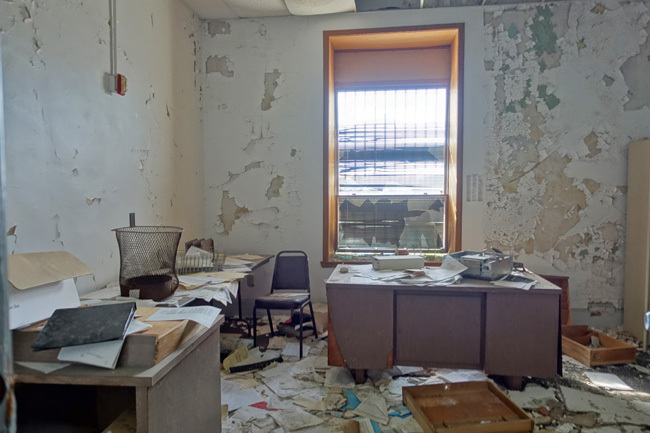 The Will County Prison Records said that they has been abandoned that prison from a very long time and I think government should take it back into action and make it open as all things are almost good there now for reopen. Seems the nicer structures could be converted to condos. Tear down the scrappy buildings and turn the grounds into beauty. It could be awesome.